The delta state police has arrested a 21-year-old disabled robbery suspect, John Okue in a hair salon in Okwashi-Uku, following a tip off. The one-legged robber, who lost his leg to a virus, led the gang of other armed robbers whose ages ranged from about 17 to 25 years. They were said to have robbed, killed and defiled their female victims with impunity. Apparently the gang was said to be highly connected to top police officers in the state so when any member of the gang was arrested and detained, his freedom was often obtained. It was reliably gathered that at a point when the police wanted to apprehend him in his home in Kwale, he escaped while he disguised as a beggar. The police officers detailed to track him down saw him but never knew he was the suspect they were looking for. This hide and seek game between the police and the armed robbery suspect continued for several weeks as he became elusive until recently when the gang leader was apprehended in a barbing saloon at Ogwashi-Uku following a tip-off. Police sources said confessional statement by the gang leader led to the arrest of other members at different locations. 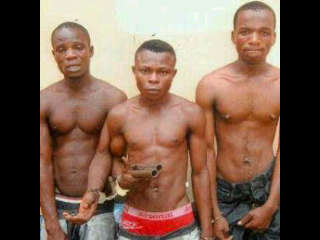 They are being detained at the State Criminal Investigation Department (SCID) Asaba. Among dangerous weapons recovered from the gang were battle axe, pump action, rifles, shot guns and AK 47 rifles.